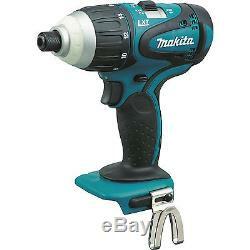 Makita XPT03Z 18V LXT Hybrid 4-Function Impact, Hammer, Driver-Drill, Bare Tool. XPT03Z 18V LXT Hybrid 4-Function Impact, Hammer, Driver-Drill, Bare Tool. Does not include battery or charger. With a variable 2-speed motor for a wide range of drilling, driving, and fastening applications. Hybrid 4-function tool with impact, hammer, driver and drill all in one. Variable 2-speed (0-700 & 0-2,300 RPM) for a wide range of drilling, driving and fastening applications. Makita-built 4-pole motor delivers 1,240 in. Convenient 1/4 hex chuck for quick bit changes. Compact and ergonomic design at only 7-3/8 long. Weighs only 4.1 lbs. With battery (battery not included) for reduced operator fatigue. Light with afterglow illuminates the work area. Ergonomic shape fits like a glove with even pressure and easy control. Rubberized soft grip handle provides increased comfort on the job. 2 spd 0 - 700 / 0 - 2,300 RPM. Impacts Per Minute 3,200 IPM. Impacts Per Minute (variable speed) 0 - 3,200 IPM. Blows Per Minute (variable speed) 0 - 27,600 BPM. Retail store pricing may differ from online pricing. International Buyers - Please Note. Unless otherwise specified, all items that plug into an outlet are 110v. Australia / New Zealand / Israel. Hardware Sales is not responsible for service transit time. XPT03ZI Standard - US only - During Checkout MAPP (Honda required) MGT0504. The item "Makita XPT03Z 18V LXT Hybrid 4-Function Impact, Hammer, Driver-Drill, Bare Tool" is in sale since Saturday, January 28, 2017. This item is in the category "Home & Garden\Tools\Power Tools\Combination Sets". The seller is "hardware_sales_inc" and is located in Ferndale, Washington. This item can be shipped worldwide.